The Clackamas Cavaliers emerged from the OSAA Class 6A girls' basketball state tournament on Saturday with a new piece of hardware for the trophy case. They didn't get the trophy they had their hearts set on. That one went to two-time state champion Southridge later in the day. But the Cavaliers at least got a chance to play on the final day of the season and didn't go home empty-handed. Tigard's Delaney Leavitt scored 11 of her team-high 18 points in the second half as the Tigers rolled to a 54-46 victory over Clackamas in Saturday morning's consolation final at the Chiles Center, clinching fourth place and relegating the Cavaliers to sixth. 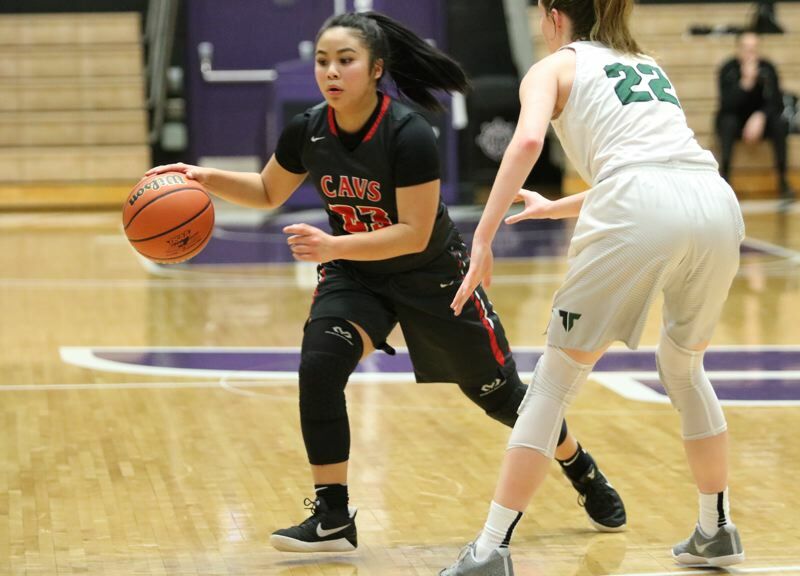 Clackamas' Bri Phiakhamngon finished with 19 points, and Savannah Duarte had 11 points and seven rebounds for the Cavaliers, who finished 24-5 in Korey Landolt's first season as head coach. "It wasn't quite what we wanted to have happen this morning," Landolt said. "I felt like our effort was there, but we just kind of ran out of gas, especially in the second half and into the fourth quarter. "But I told them, overall they should be super-proud of the season that we had. They learned a lot of new stuff this year with a new coaching staff. We throw a lot of stuff at them, there was a lot of trial and error, and they were focused and they came to work every day and it was a great experience." The Cavaliers were hoping for a better sendoff for their five seniors – Elly Bankofier, Megan Huynh, Ciara James, Duarte, and Phiakhamngon – but they had too many defensive breakdowns at one end of the court and too many missed opportunities to overtake Tigard after the Tigers opened a 24-19 halftime lead. Clackamas was still within striking distance when Phiakhamngon scored on a lay-in to cut Tigard's lead to 27-25 with 2:58 remaining in the third quarter, but then Leavitt hit a pair of 3-pointers during an 11-4 run that pushed the Tigers lead to 38-29 with just under six minutes to play in the game. Duarte scored for Clackamas to make it 38-31 and then the Tigers reeled off 14 consecutive points to put the game out of reach. "Tigard is known for hitting a big shot and then going on a little run," Landolt said. "We just couldn't answer on the offensive end. It was one of those things where Tigard wold scored and we were like, 'All right, let's go pound it down their throat,' and then we'd come up short and miss a lay-up or miss a free throw … or lots of free throws. "I think it could have been a different game if we would have made some free throws." James finished with four points and a game-high 11 rebounds, but Kalani Hayes and Bankofier both struggled with their shots, scoring a combined five points on 2-for-12 shooting from the field. For the game, Clackamas shot 38.5 percent (15 for 39) from the field, 33.3 percent (4 for 12) from 3-point range, and 66.7 percent (12 for 18) from the free-throw line. The Cavaliers had a 27-20 advantage in rebounds but also had 14 turnovers to Tigard's eight. Tigard's Campbell Gray finished with 13 points, three rebounds, and three assists for the Tigers, who shot 43.2 percent (16 for 37) from the field, 31.3 percent (5 for 16) from long range, and 68 percent (17 for 25) at the foul line. "Clackamas missed some shots and we made some shots, and sometimes that's just what it comes down to," Tigers coach Steve Naylor said. "It's not even about strategy. Sometimes you just make more shots than the other team and that's kind of what we did today." The Tigers entered the playoffs as the No. 2 seed but had their championship hopes derailed in Wednesday's quarterfinals when they lost 32-28 to No. 7 Benson. "We ended up beating Sheldon on Thursday and we played on the last day of the season, and you win our last two and it feels a lot better than it did on Wednesday night against Benson. It's a good way to end the season, for sure." Clackamas, the second-place team out of the Mt. Hood Conference, drew the No. 9 seed in the 32-team bracket and opened the playoffs with wins over Lincoln and Jesuit before falling 57-42 to top-ranked and eventual-champion Southridge in Wednesday's quarterfinals. The Cavaliers then stayed in the trophy chase with a 43-37 win over North Medford in Thursday's consolation semifinal, setting up Saturday's final game against Tigard. "It was a great season," Duarte said. "We all worked hard, we played our hearts out, and we made it all the way to the end, as far as we could. And even to the last second, we played our hearts out." The Cavaliers faced challenges this season, none bigger than the loss of junior shooting guard Alyson Miura, who went down with a broken bone in her right hand and missed the final four regular-season games and all of the playoffs. Even with that, they found a way to keep playing all the way until the second week of March. "This is such a good group of kids," Landolt said. "We tried to build a family atmosphere and, of course, in every family there are disagreements, but this group stayed together. They had goals and they were able to overcome adversity quite a few times. "The group of seniors that I have, I'm going to miss like crazy, because they're just good people on top of being good basketball players. So, I wish them the best." Some of them aren't done playing yet. Bankofier is headed for Chaminade University in Honolulu, Hawaii; James for Weber State in Ogden, Utah, and Phiakhamngon for Central Washington in Ellensburg. "My senior year was great," Phiakhamngon said. "All my teammates and I bonded well. Most of us have played together since we were in elementary school, so we grew up with each other and played this game together and grew together, and the relationships that I built with everyone were great. "A lot of teams don't get this opportunity to play in the state tournament. Just being able to play at the Chiles Center your senior year, even if it wasn't the outcome that we wanted, it was still all I could ask for." Clackamas (46) -- Bri Phiakhamngon 19, Bankofier 3, Hayes 2, James 4, Duarte 11, Mongelli 2, Huynh 1, Morris 3, Filler 1, Wetzell, Tacheny, Garcia. Tigard (54) -- Delaney Leavitt 18, Brown 3, Gray 13, LaFountain 8, Lyons 7, McGaughey 4, Jedan 1, Britch, Klum, Billings, Kadel, Erickson.